Hike, kayak, and bike your way through Guatemala. Be amazed by raw natural beauty, wonderfully rich Mayan culture, and endless opportunities for active adventure. Discover Guatemala, a country rich in diversity and natural beauty, on this 8-day multi-sport adventure. Experience Guatemala's intriguing blend of Mayan culture and Spanish colonial influence as you stroll through the amazingly well-preserved colonial town of Antigua, with its cobblestone streets, ruins, elaborate churches, and bustling market. Hike to the summit of the active, fiery Pacaya Volcano and spend the night under the stars on the slopes of Acatenango Volcano, with an epic view of the nearly constant eruptions from neighboring Volcán de Fuego. Go on a cycling tour of the Almolonga Valley and immerse yourself in the Mayan-influenced culture of the local towns and markets. Spend two days hiking, kayaking, and mountain biking around the simply magical Lake Atitlan. This is Central America's deepest lake, filling an ancient caldera framed by surrounding volcanic peaks, and is widely considered to have one of the most picturesque lakefronts in the world. Return from this action-packed escape inspired by both the rugged beauty of the land and the warmth of the people. Arrive at the Guatemala City airport. A shuttle will meet you at the airport and a representative will be there to greet you with your name on a card. Meet the driver outside of customs as you exit the building and take your 45-minute transfer to your hotel in Antigua. Meet at Old Town at 9:00 am and walk to the bike storage for sizing and quick gear explanations. Riding to the south, you'll head out of Antigua and onto the base of Agua Volcano. You'll explore the various towns and villages of the Almolonga Valley and your guide will make plenty of stops along the way to show off the magnificent churches and Spanish colonial ruins. 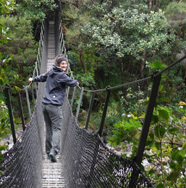 You’ll also visit an experimental macadamia farm and explore local textile markets. Meet at 8:00 am at the shop and fill up your water bottles before heading off to climb Pacaya, an 8,300-foot active volcano. This hike takes about 2 hours to reach the top, including a trip up the cone to take a look into the crater (if conditions allow). Enjoy lunch after summiting and then wind your way back down to the car. You'll return to Antigua around 3:30 pm. Begin your first day of pedaling and paddling! Start by jumping on your bike and dropping about 2,000 feet while taking in one-of-a-kind views of Lake Atitlan and the surrounding volcanoes. After a picnic lunch at a lookout point, roll into the lakeside town of Panajachel where you’ll have some time to explore the markets before taking a boat to your lakefront hotel. This boutique hotel is perched on the cliffside and is only accessible by boat and footpaths. After waking up to gorgeous views of the lake, you'll begin your morning with an open-water kayaking adventure on Lake Atitlan’s deep blue-green volcanic waters. Paddle along the northern shore and beneath the towering hills for a few hours, then swap out your paddle for hiking shoes and walk along the cliffside trails high above the lake. Hike through local towns and complete the spectacular trilogy of viewpoints by bike, kayak, and foot. Time to put some trail under your feet and gain some altitude. Meet at the shop at 8:00 am and then head off to Acatenango Volcano, the 3rd highest volcano in Guatemala. Climb 6,000 feet through 5 different climate zones to a final altitude of 13,044 feet. Camp for the night in a campsite bench-cut into the south ridge of Acatenango, overlooking Fuego, and take in incredible starry-sky views. Hike 3 hours down to the local community of La Soledad, where you'll be transferred back to Antigua. Take the whole afternoon to explore Antigua, do some last minute shopping, or just relax back at the hotel. Enjoy one of the many fine dining options in Antigua on your last night. Say your goodbyes and take a shuttle transfer to the airport as needed for your flight back home. Founded in 1998, Old Town Outfitters is a full service adventure travel and destination management company (DMC) located in the Spanish colonial town of La Antigua. They specialize in designing custom-built trips for both organized groups and independent travelers. Old Town strives to provide unique, high quality trips which create rewarding experiences for their clients. On my two month Central American trip, this was the best thing I did! Beautiful landscape and professional equipment and guide. Perfect! Just wanted to let you know that the trip was EXCELLENT. Thank you again. Richy and Oseas were incredible. Always on top of their game, friendly, and very personable. I would highly recommend doing trips with Old Town. We all agreed that we had a fabulous time, it was a wonderful way to cap off our Guatemalan trip as a family. Thank you guys for a great couple of weeks in Guatemala. We had so much fun, it was a blast from the word go! Thanks for all the hard work for our benefit - and for keeping the trip such good-humored fun! Please wait until you receive confirmation from Old Town Outfitters before making any travel arrangements. Yes, this trip is guaranteed! However, please do not make any travel arrangements until you receive confirmation from Old Town Outfitters. Fly into Guatemala City (GUA Airport), where a tour representative will meet you for your transfer to Antigua. Upon exiting the airport, look for the driver holding a sign with your name on it. Spend six nights in three-star hotel accommodations and one night tent camping. Stay in either El Carmen or San Jorge in Antigua, both long-standing hotels with beautiful patios and lush gardens, respectively, and both conveniently located only a few blocks from Central Park. Casa del Mundo is a boutique hotel built into the cliffside overlooking Lake Atitlan and its towering volcanoes. Your campsite on Acatenango Volcano will have all the basic essentials (tent, sleeping bag, sleeping pad) as well as amazing views to its neighbor peak: the active Fuego Volcano. Enjoy a campfire at night with spectacular views of eruptions from Fuego. Prices are based on double occupancy, though you can request your own room for a single supplement fee of $360, payable directly to Old Town Outfitters. Your trip cost includes all daily breakfasts, four lunches, and two dinners. Three of the lunches will be fresh picnic lunches during the tours. All of these will be vegetarian. The fourth lunch and first dinner will be at the restaurant in Casa del Mundo. The second dinner will be freshly prepared in camp on Acatenango. Plan to bring an extra $100 for meals which are not included. Also plan to bring money for souvenirs and tips for guides. What should I bring? Do you have a packing list? What considerations should I make for the weather? A note on the weather: Antigua and Lake Atitlan are both about a mile high in altitude. The days are sunny and warm in the high 70s and the nights tend to be in the 60s. Bring shorts and t-shirts for the days, but be sure to bring some warmer clothes for the nights. The campsite for the Acatenango trip tends to be in the 40s at night. We highly recommend purchasing travel insurance for all trips. Travel insurance allows you to seek reimbursement if you are forced to cancel your trip for unforeseeable reasons, or if you need to cover medical help, emergency transport, and/or theft or accidental damage while traveling. For travel insurance, we recommend World Nomads. Book confidently with Free Cancellations within 72 hours of booking. After 72 hours, cancellation fees will apply. Cancellations are subject to the full discretion of Old Town Outfitters. For more information on our Travel Cancellation Policy please Click Here.